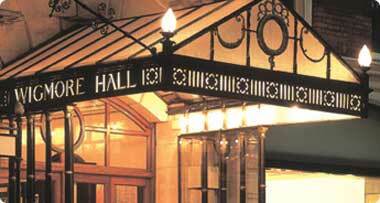 A "regular" at Wigmore Hall for some ten years, until I was lured to Israel in October2003 by a slim, quietly spoken, chamber music-loving Israeli lady [a rare combination], I return to London/Wigmore Hall as often as possible. Here is a report on my most recent visit. Five concerts included vocal music: the first, on my first evening back in London, was superb: Toby Spence, tenor, with Graham Johnson: Purcell/Britten 3 Divine Hymns [effectively adding a continuo part to Purcell's fully realised vocal and bass lines], Berlioz' Nuits d'ete, Poulenc's Tel jour,telle nuit and more Britten, 7 Sonnets of Michelangelo. Fine voice, superbly modulated [full range of volume and nuances], good diction, fine interpretations, apart from occasional mild wooliness of French pronunciationclose to perfection; GJ as authoritative and sensitive as ever. Christopher Maltman is another singer I saw when he was an RCM student, later singing Winterreise at the Wigmore and at Edinburgh. I liked him and continued to for several years, so, having good reports of him also, I booked for his recital [also with GJ], Schubert and Brahms. He has made enormous strides, most particularly in the volume of sound he can produce; a bawling baritone, whether appropriate or not, such as when serenading a girl who was worried in case her mother found out; he sang as if he wanted the whole village to know. Some of his facial expressions were unpleasant also. Claire Booth had been due to sing with the Nash Ensemble [the Pickfords of the concert stage, great furniture movers!] in Colin Matthews' The Island, written for her and the Nash in 2007, but she had to withdraw and was replaced at short notice by Lore Lixenberg; a very small voice, perhaps from the short notice, but possibly the voice was intended to be simply a colouration of the instrumental sound? The Vertavo Quartet of Norway [including Mrs Paul Lewis] has always attracted me by their fine performances [and determined facial expressions, in particular those of the Vaernes twin sisters] and didn't let me down in either respect in their two concerts [Wolf Italian Serenade,Dvorak "American", Beethoven "Harp" and Op18/1, and Brahms Op 51/1. I felt that the Pavel Haas Quartet was a little over-rated when they first became BBC Young Artists, but they have certainly caught up with [and overtaken] their reputation. Their Prokofiev 1 and Ravel, in a lunchtime concert, then Pavel Haas 1, Smetana 1 and, with Shai Wosner, the Dvorak Op 81 piano quintet were all very pleasing in a full evening concert. Three quartets played in the Wigmore's continuing complete Haydn series, the Ebene, Navarra and Endellion. The Ebene, three young Frenchmen,gave us Op71/2,74/2,33/1 and 64/5 on 28 February; very energetic [flat out!] electric renderings - no loss of sensitivity. Magnifique, but I had a [small] nagging feeling that it might not have been la guere (as one of their fellow countrymen is renowned for having said). They returned fully refreshed for a Coffee Concert the following morning, with Op71/3, plus Beethoven Op127. The Navarras [three Dutch, one English, ex RNCM], were rather wooden in Opp 17/1,33/2,33/6 and 76/4 until the 'Sunrise', despite large physical movements by V2 and Va and every tormented facial expression imaginable; Vc, V1, in contrast, remaining expressionless throughout. The Endellion were variously gentle and genteel in Opp54/1,50/5 and64/1. Shai Wosner [Israeli, now based in the USA] in a BBC lunchtime concert, Debussy Preludes, bk1, Schuman Carnaval; satisfactory, albeit a little diffident, as was his stage manner. Richard Goode was well up to his name and reputation, except, perhaps in the Schubert D960, which followed the JSB Prelude & Fugue, BWV885,and French Suite BWV 816, and Chopin, 5 Mazurkas and other works. His more or less continuous vocalisation as he played was only occasionally audible [the dubious pleasures of sitting in B7!]. Llyr Williams, rather surprisingly only his first full-length recital at the Wigmore, was more restrained in his mouthing [a gentle chewing motion]., otherwise quite magnificent, revelatory performances of Schubert in D 958, Debussy Estampes and Mussorgsky Pictures at an Exhibition, a work which you should not normally be followed with an encore, but, as it was Saint David's day, we forgave him for playing a short piece, specially composed for the occasion by Geraint Lewis, "All the Waters of the [River]Wye", wildly applauded by his supporters club. The Wigmore Study Groups, one per booking period, all led by composer Julian Philips, study in some depth a work, genre, instrument or whatever which is to feature in the concert following. This group was devoted to the Haydn String Quartets, their history, performance and, in particular,the new critical and performing editions of the whole lot, recently completed by Simon Rowland-Jones, composer, teacher and performer [10 years as viola player with the Chilingirian String Quartet] who described his work [extending over ten years!] on the new editions of Bach's cello suites, many of which are already in use, and how he had come to be involved. Peters Edition accepted for publication the first ever complete version for viola, which he completed, played and recorded in the mid 1990s. Tongue in cheek, he asked them when they would get around to producing new editions of the Haydn, Beethoven and Schubert string quartets, all existing editions being notoriously poor. Which would you like to do first? - was the reply. Haydn, he said. He was silent as to whether he was going to get round to work on the other two. Gould Piano Trio, once described to me by John Gilhooly, Director of Wigmore Hall, as "rather under-rated". He has now put his money where his mouth is: the concert was recorded for the WH own label. Schumann's Fantasiestucke, and Korngold's Piano Trio Op 1, quite lively and adventurous, but notable more for his age when he composed it, 12, than for its musical quality. Then a fine performance of a more significant work, Mendelssohn's 2nd trio, Op66. Buy the CD when it appears! The King's Consort, fine orchestral support of Lucy Crowe in the Wedding Cantatas, and fine performances of two other JSB works, Harpsichord Concerto, BWV1052 and Orchestral Suite BWV 1067. TKC has announced that its name will change to Retrospect Ensemble w.e.f. 1 May, from which it appears that Robert King, who has been unavailable, will not resume his place. "ensemble f2", a period instruments group, led by Gary Cooper [keyboards] and Rachel Podger [violin], both highly regarded, in the group's debut concert. The programme document offered no explanation of the name, but I am reasonably certain that it has nothing to do with motor-racing. Perhaps the two sound-holes [the f-holes] on string instruments.The group is devoted to the performance of Haydn symphonies and other orchestral works, and to Mozart chamber works. This debut concert was devoted solely to Haydn, Symphonies 44 and 49, keyboard concerto HobXVIII-II and violin concerto Hob.VIIa:1. Fine performances all, marvellously clear. Fifteen players in all, all experienced period-instrument performers, from all over Europe, including, as sole viola player, Alfonso Leal del Ojo Chamorro, a former student at GSMD and a Wigmore Hall usher! Their next concert, of Mozart chamber works, will be on Friday, 17 April at Wigmore Hall. If you are interested in Mozart on period instruments, you should be there. A mixture of chamber works, performed by front-desk and other leading members of the LPO, ranging from the Dvorak Terzetto,Op74 ,"modest dimensions and generally relaxed in mood, originally intended for amateur performers, but found to be too difficult, so diverted to a group of professionals". Attractive, well-played, followed by Weber's Quintet for clarinet & strings, again well-performed, apart from the clarinet being too strident at times. Finally, the Mendelsson Octet, enjoyable, albeit a little ragged at times, from a group more used to having a conductor. Seven works, all modern, all by British composers, all but one written for the Nash, who did have a conductor for one of the pieces, Martyn Brabbins. All works were reasonably or totally accessible for this aged reporter, all performed well, but one [don't ask me which] too long. To me, and to the Guardian critic, the outstanding piece was Julian Anderson's "Prayer for Viola", superbly played by Lawrence Power. My first sighting of Ehnes, a fine, unmelodramatic performer, good performances of Leclair, sonataOp9/3, Prokofiev 2 and the Ravel Tzigane, well justifying his reputation, but not his statement that the reason for their encore being "off-air" must have been an under-estimate by the BBC of their probable playing-time: far more likely it was because he [Ehnes] tuned onstage for each piece!